Ever light up some cannabis and gotten paranoid (something we call weed-anxiety)? It’s happened to a lot of people who smoke or ingest marijuana, so it seems counterintuitive to think pot can actually treat symptoms of anxiety, but that’s what current medical literature is showing. The medical stance for years has been that marijuana causes and worsens anxiety disorders, a family of mental illnesses outlined in the DSM-V, psychiatry and psychology’s diagnostic Bible. 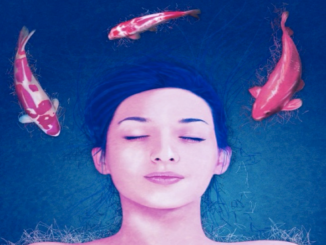 This assumption is changing as researchers shed more light on the function of the body’s own endocannabinoid system to regulate mood and cognition. The confusion comes from the fact that some compounds in marijuana do promote anxiety, but others calm the symptoms of anxiety. Furthermore, no two marijuana strains are the same, differing in percentages of active cannabinoid chemicals. Also, few decent studies look at dosage or have controlled for placebo. Can weed make you anxious? The anxiety-provoking effect of THC is well documented, however. Dronabinol (Marinol) is a synthetic version of THC that drugmakers isolated back in the 1970s to stimulate appetite and reduce nausea in cancer and AIDS patients. Anxiety and paranoia is a serious side effect, according to the Food and Drug Administration’s prescribing information. A study looking at the impact of full-spectrum cannabis vs. isolated THC showed greater effectiveness for the full-spectrum. Much like with Dronabinol, cannabis could worsen anxiety if used in its isolate form (or if there is too much THC). Instead, a well-rounded blend with a 1:1 THC:CBD ratio would be beneficial. Part of the misunderstanding about the role of weed in anxiety comes from the kind of studies used to make the connection. Because legal restrictions make pot is so difficult to obtain for research, most of the medical literature connecting marijuana to anxiety problems comes from the substance abuse treatment field. Many times, cannabis studies use isolates, which are not as effective as the full spectrum of cannabinoids and terpenes naturally occuring in the plant. Indeed, full spectrum has more medicinal value. These studies largely rely on study subjects’ self-reporting, with no controls on the strain, quality, dosage or method of administration for the cannabis involved. Furthermore, the vast majority of participants in substance abuse studies are using alcohol, tobacco, and other drugs along with marijuana, making it nearly impossible to tease apart the co-variable effects. Be sure to read our expose on the bias of cannabis studies. Another issue with relying on studies on self-described addicts seeking treatment is a problem of correlation. It’s well known in the psychological community that people with anxiety, depression and other disorders tend to self-medicate with drugs and alcohol. Therefore, there’s no easy way to address whether the self-selected group of study participants in the substance recovery population already has a higher prevalence of generalized anxiety disorder and other anxiety-related conditions. A 2014 study in the Journal of Clinical Psychopharmacology showed administration of cannabidiol in a double-blind, placebo controlled study drastically reduced anxiety in patients with generalized social anxiety disorder. Be sure to read our full article on Cannabis for social anxiety disorder. The sample size for this study was small, but highly valuable because results were measured through neuroimaging, rather than only self-reporting. In other words, scientists could watch on a functional MRI machine the regions of the brain responsible for anxiety calm down as the cannabidiol doses were administered. 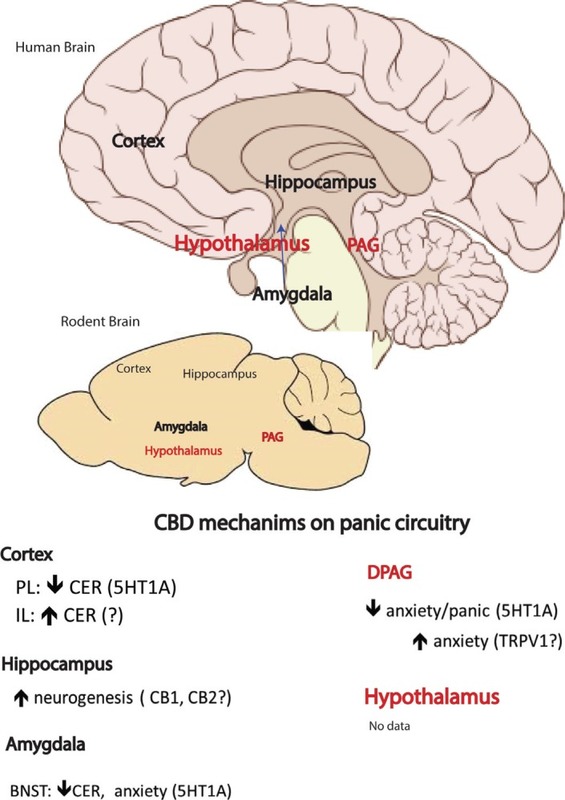 CBD interacts with the brain circuits responsible for inducing panic. Figure from Soares et al. (2017). The most current research is a meta-analysis looking at panic disorder published in 2017 in Current Neuropharmacology that takes into account results of dozens of human and animal trials. This study showed a strong anti-anxiety effect from cannabidiol. Panic disorder is one of several disorders under the anxiety-disorder umbrella laid out in the DSM-V.
Another promising avenue for research that scientists have yet to fully explore is the potential for cannabis to calm the anxiety symptoms related to post-traumatic stress disorder. This was a major theme of the most comprehensive meta analysis of marijuana medical literature to-date, published in February, 2017 in the Journal of Clinical Psychology.